Mitt Romney and Rick Perry’s exchange about Social Security during the last debate at the Reagan Presidential Library drew a lot of attention for various good reasons. 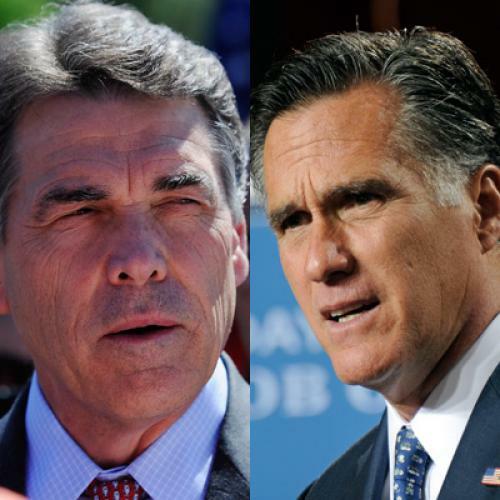 It showed that Romney was willing to criticize Perry “from the left” on an important federal domestic program. It showed that Perry isn’t backing down on a radical approach to entitlement programs, at least for people who aren’t over or near the retirement age, and that he won’t directly retract his attacks on Social Security and Medicare as immoral and un-American. And arguably, it showed that Perry, the new consensus Republican front-runner, is willing to run a pretty big risk in electability in order to protect his right flank and make Tea Party folk happy. But if all these implications of the Romney-Perry clash are reasonably clear, there is a more subtle but possibly even more significant additional consequence of Republicans arguing over whether to demolish or merely slash Social Security and Medicare: It will materially aid Barack Obama’s high-stakes effort to make the 2012 presidential election a choice between two very different visions of American government, rather than a referendum on his administration and its handling of the economy. FOR THE PRESIDENT, the whole ballgame is to convince voters that it’s not possible simply to fire him and bring in fresh new management, or even to repeal Obama “mistakes” like health care reform or the 2009 stimulus legislation. According to the preferred re-election narrative, a Republican victory will not mean going back to November of 2008—bad as circumstances were at that juncture—and starting over. It will mean inviting a radical experiment in domestic government that involves shredding a social safety net, a set of basic regulatory policies, and a modern federal government that were put together painstakingly by Republicans and Democrats from the late 1930s onward. Republicans, of course, will resist this interpretation of the choice and will insist they are simply reining in a runaway federal government led by arrogant and incompetent vote-buyers who are wrecking the economy in order to consolidate still more power in Washington. That’s why the more radical intentions that the conservative base is urging candidates to pursue are so often couched in dog-whistle code language like “constitutional conservatism,” “restoring the 10th amendment,” and liberating “job creators.” And even Perry is now trying to refashion his criticism about Social Security into an argument about its current condition—the “monstrous lie” that this “Ponzi scheme” can keep its promise to younger Americans without a severe curtailment of benefits or abolition of the entitlement altogether. It’s already too late, however, for Perry to backtrack on his fundamental objection to Social Security, Medicare, Medicaid, federal aid to education, and federal environmental protection laws. In Fed Up, Rick Perry usefully and repeatedly communicated this radical message without bothering to encrypt it, fulminating not just against Obama or Barney Frank or public-sector union bosses or other contemporary bugaboos, but against virtually every expansion of federal power since the earliest stages of the New Deal. And having essentially proposed a referendum on the policies of Franklin D. Roosevelt and Lyndon Johnson and Richard Nixon and Bill Clinton and both Bushes, he has decided to stick to his guns. Naturally enough, now that Mitt Romney is attacking Perry’s all-too-specific domestic policy radicalism, it can be argued that a Romney victory over Perry might help insulate the GOP from accusations of radicalism in the general election. But Romney’s own credibility issues with the conservative activists who will largely determine his fate in the early caucuses and primaries will inevitably require him to package his criticisms of Perry with his own dangerously specific ideas for “entitlement reform.” This competition will simply draw more attention to the whole subject of the two parties’ very different governing philosophies—a partisan differentiation that Obama’s jobs speech last week sought to promote after many months of relentless bipartisan rhetoric from the White House. So long as the president does not pull the trigger on a deficit reduction deal with congressional Republicans on Social Security and Medicare that could blur these differences, the Romney-Perry battle could crucially change the nature of the general election. And the invisible primary’s focus on Social Security and Medicare is likely to become even more intense tonight, as the Republican candidates hold another debate in senior-rich Florida. Every moment they spend sparring over the New Deal and Great Society is a boon to Barack Obama. Even if the incumbent cannot win a referendum on his own presidency, he can win a competition between the ghost of Barry Goldwater and the ghosts of FDR and LBJ. Ed Kilgore is a special correspondent at The New Republic.